For some time now I'm keeping a page at ZEEF.com about Java EE 7. The page covers pretty much all Java EE 7 technologies, so the amount of clicks on the links of this page may give some indication of what parts of Java EE 7 are most popular with users. As can be seen the general Java EE 7 topics are by far the most popular. There may be multiple explanations for this though. Is it simply the fact that the block containing the Java EE 7 links is the top left one (which people thus typically see first), or the fact that the page's title is "Java EE 7", so it primarily attracts people looking for general Java EE 7 stuff? Or is it indicative that people are increasingly seeing Java EE 7 as a single platform instead of a mere collection of individual specs? After Java EE 7, a link about what's new in JAX-RS 2.0 was the most popular one, closely followed by links about JSF 2.2 and CDI 1.1. Aggregated on total clicks per category (not shown in the table) JSF 2.2 was the most popular category after Java EE 7. With some distance we see JSON-P, JBatch, Bean Validation 1.1, EJB 3.2, EL 3.0, Concurrency utils for Java EE and JASPIC 1.1. Remarkable is that JPA 2.1, JMS 2.0, Servlet 3.1 and WebSocket didn't make it into the top 20 list for the last 8 weeks. Also remarkable is that JASPIC 1.1, which normally doesn't seem to be that well known among users, just barely makes it into the top 20 of most popular links. We can't draw too many conclusions from this list, as the location of the link blocks on the page, the position of the links within each block, as well as the titles of the posted links play a role as well. 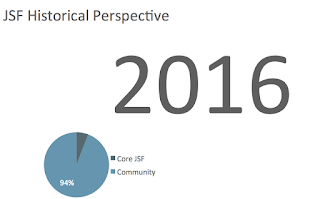 As I'm active in the JSF community and not in say the JPA one, there may be some bias for JSF as well. Still, the page has a diverse amount of links, a diverse amount of referrals and there were a few thousand visitors over the last 8 weeks so I hope the data gives us at least some insight.